For people who have lived in the Lower Mainland for an extended period of time, it comes as no surprise that the best Chinese food is found in Richmond and the best Indian food sets up shop in Surrey. Furthermore, the largest selection of Korean restaurants are located along North Road. 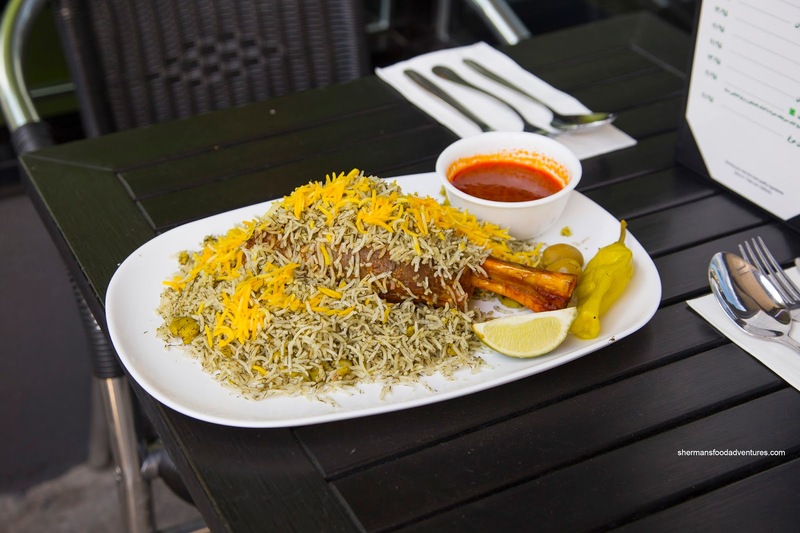 However, how many people realize that the go-to place for Persian eats is on the North Shore? Well, I guess for some that is not surprising, but it is interesting to note that it is not as well known as the aforementioned eats. 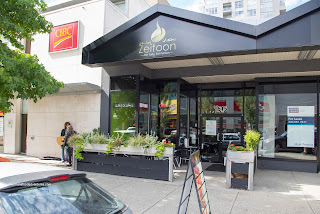 Even armed with that knowledge, I've only ventured into North Van for one Persian dining experience. With an invite to Zeitoon, that would make it 2 (I guess I should venture out to NV more). Since I could only eat so much, Sean accompanied me on this food adventure. 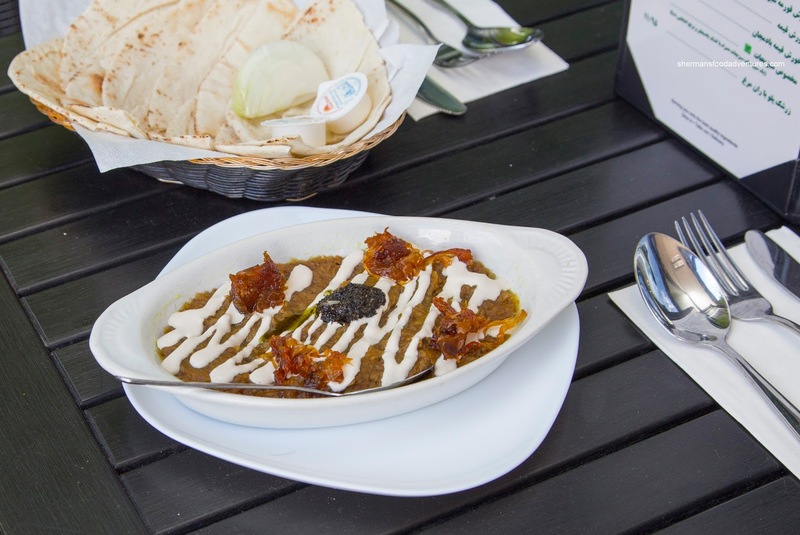 Things began with the Kashk Bademjan consisting of deep fried mashed eggplant, sauteed onions, garlic and fresh mint. 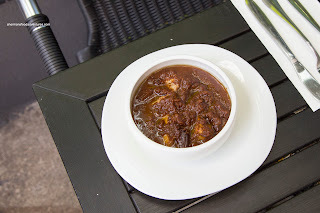 We really enjoyed this as the soft and silky eggplant was mildly sweet, but best of all, accented by the caramelized and candied onions on top. Furthermore, the garlic really came through adding more aromatics as well as the background mint essence. 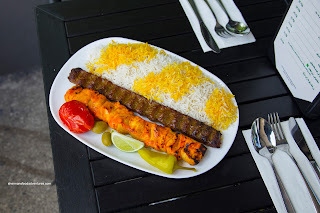 Onto our mains, we shared the Vaziri with one each of the boneless chicken and koobideh ground beef skewers. This ate as good as it looked where the meats were grilled expertly. With the chicken, the nicely seasoned breast meat was succulent exhibiting a mild savouriness interrupted by hints of acidity. As good as that was, the koobideh was better with juicy and well-seasoned ground beef. The meat was processed enough that it was super moist and soft while still retaining a meatiness. The bits of onion were sweet and aromatic. Next, we tackled the Lamb Shank slowly braised and served with with Baghali Polo (basmati rice, dill weed, lima beans). Super moist and fork tender, the lamb was on point. There was a depth-of-flavour that was not too gamy where the braising liquid exhibited light tomato and cumin. Our last dish was my personal favourite being the Fesenjoon Stew consisting of chicken breast in a sauce of walnuts and pomegranate. I am a sucker for anything tart and acidic, hence, this dish had me at pomegranate. Sweet and tart, the sauce was appetizing and super impactful. It went perfectly with the chewy rice. As much as chicken breast can be rather stringy in a stew, it was not in this case. Although we only sampled 4 dishes, it left us wanting to try more in the future. The food was prepared with care where textures and flavours were on point.